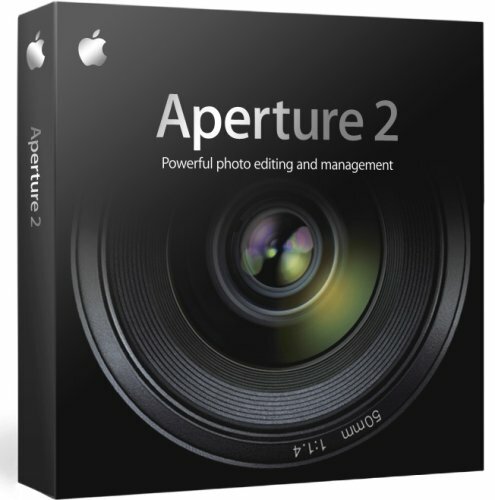 Aperture 2, Apple’s groundbreaking photo editing and management software, delivers more than 100 new features that make it dramatically faster and easier to use and even more powerful. Featuring a streamlined user interface, Aperture 2 provides accelerated performance with its optimized database and new Quick Preview mode for rapid-fire browsing. Thanks to advanced image processing with powerful new tools—such as Recovery, Vibrancy, Vignette, and a soft-edged Retouch brush—you’ll get the most out of every image. And thanks to integrated MobileMe Gallery support, you can showcase your work on the web in minutes. From importing images to publishing them online or in print, Aperture 2 helps you realize your creative vision. Mac Pro, MacBook Pro, MacBook, MacBook Air, Mac mini with an Intel Core Solo or Duo processor, iMac with a 1.8GHz or faster PowerPC G5 or Intel Core Duo processor, Power Mac G5 with a 1.6GHz or faster PowerPC G5 processor, 15- or 17-inch PowerBook G4 with a 1.25GHz or faster PowerPC G4 processor. Download the User Manual here from Apple.com. This is a sealed, unused CTO Retail version of Aperture 2.1 International version. Only the sealed disc and serial # are included.